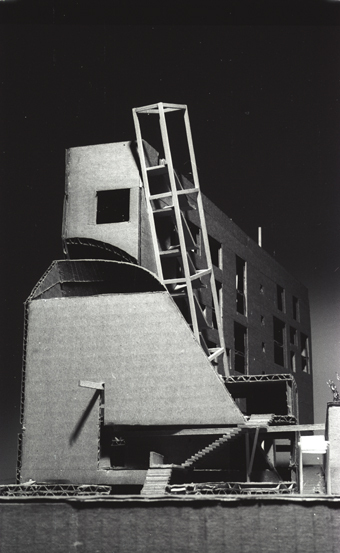 My thesis project at the University of Waterloo, ‘Sacred-Profane Mixed-Use Building’ (advisor: Ryszard Sliwka, 1989), addresses the reconstruction of Montreal’s Unitarian church on Sherbrooke Street West, a structure which lay in ruin after it had been burned down by its (transgender) organist some years before. Due to financial difficulties, a new church could not be built without the property being developed with luxury condominiums to offset costs. The situation thus demanded some sort of mixed-use design incorporating both ‘the sacred and the profane’, realms normally kept architecturally segregated in western culture. 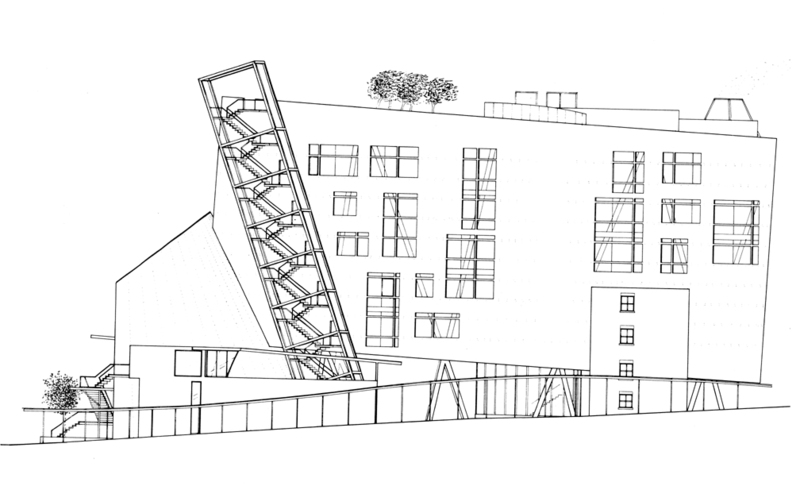 The thesis project thus embraces the contemporary urban condition as one that is inevitably messy, requiring an attitude of ‘dirty realism’ more than utopian idealism. 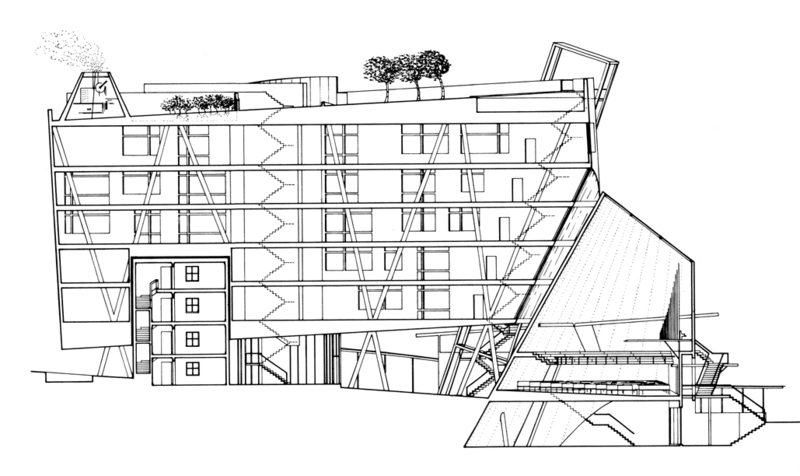 The proposal consists of two volumes: a monolithic church firmly anchored in the ground at the lowest part of the sloping site, where the previous 19th century stone church was entered, and a small housing development propped up on Corbusian ‘pilotis’, rising above the church and invading part of its airspace. 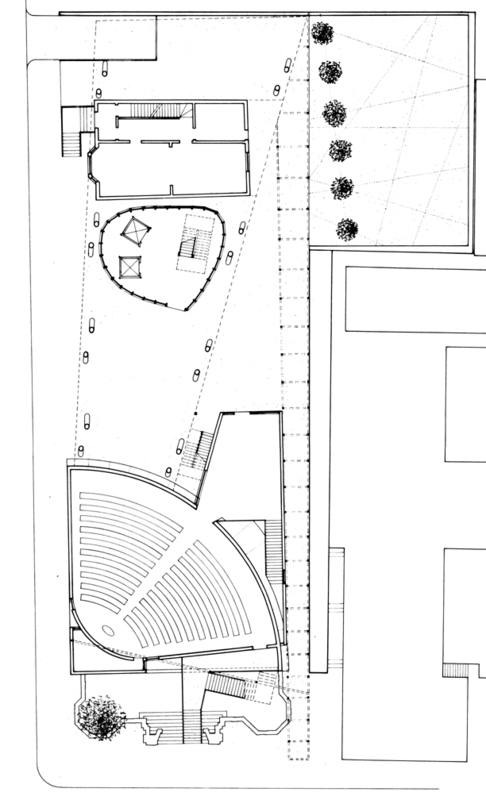 The luxury housing development is entered via a lobby at the highest point of the site. 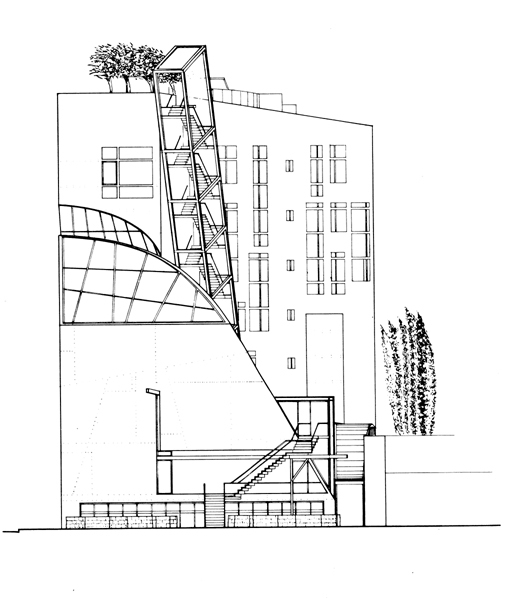 The two volumes are physically separated by a sliver of air between the convex sloped roof of the church and a similarly concave, cantilevering end of the residential building. 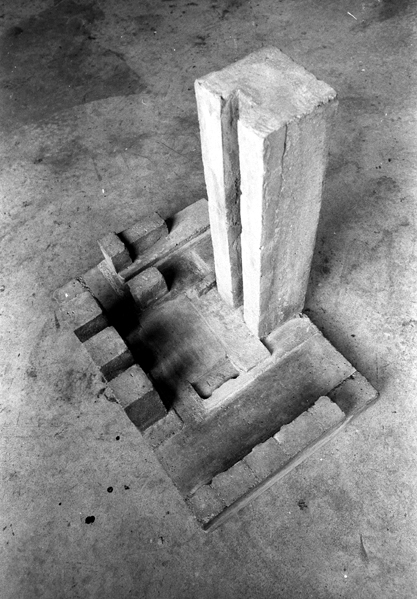 Nevertheless, elements belonging to one volume appear to blend and architecturally ‘belong’ to the other, such as the exterior fire escape structure of the condominiums, which looks like the bell tower of the church, but isn’t, or the church volume itself, which appears to provide a ‘foundation’ (moral?) for the condominiums, but actually doesn’t. The two mixed uses thus form an interdependent, dense and complex whole that is in subtle conflict; a microcosm of the city in all its messiness. 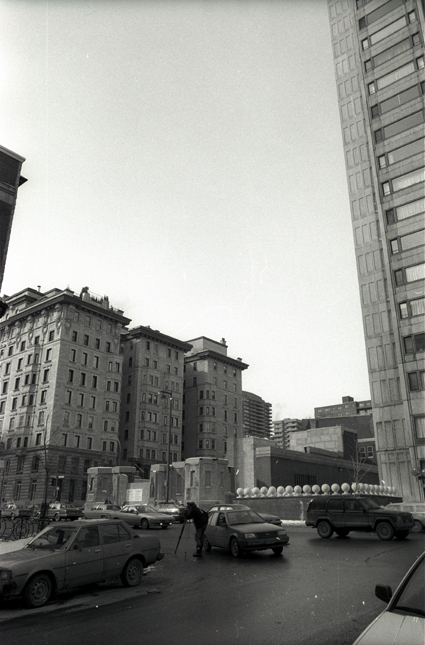 Site of the remains of the Unitarian Church of Montreal on Sherbrooke Street West in 1988. 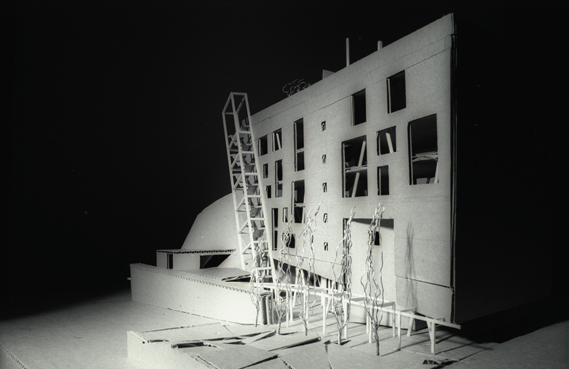 Site model, scale 1:200. Reinforced concrete. 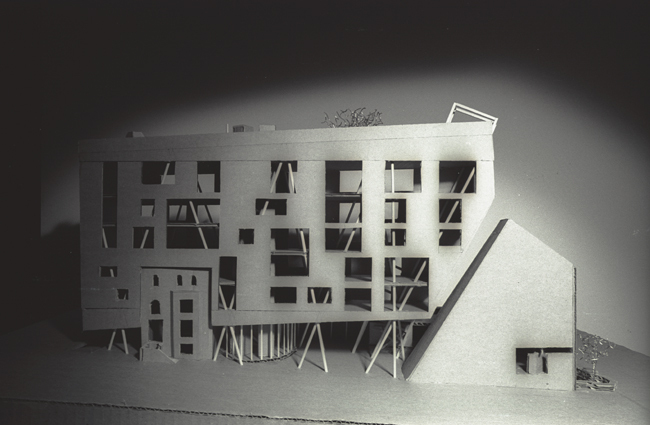 Site model with initial massing proposal 1:200. 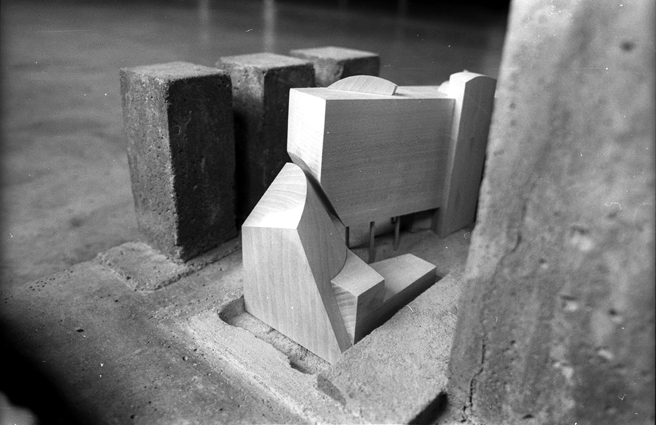 Reinforced concrete, bass wood. 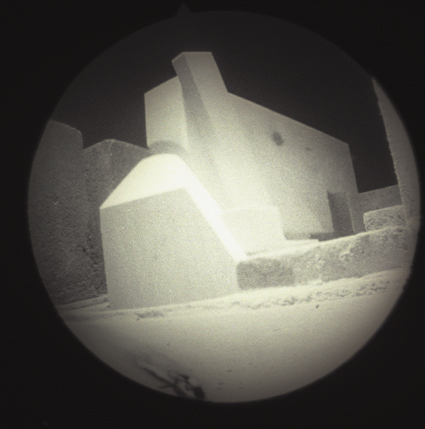 Modelscope photograph of final massing model.